Supplies of essential commodities to Goa remained unaffected on Thursday despite the strike call given by traders from Maharashtra and Karnataka protesting against the levy of entry tax on vehicles coming to the coastal state. "The vehicles carrying essential commodities like milk, eggs and groceries arrived during the wee hours into the state as scheduled. 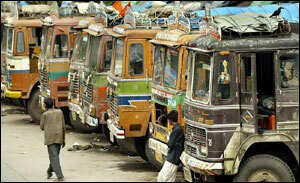 All supplies are normal," State Transport Minister Ramakrishna Dhavalikar told reporters on Thursday. The state government reiterated that it will not roll back the entry tax that has been levied on vehicles entering Goa since April 15. All India Motor Transport Congress had given a call to boycott supplies to Goa from Thursday onwards. This had received support from Belgaum (Karnataka) traders. The state government has exempted for 15 days, the vehicles registered in Belgaum, Karwar and Sindhudurg districts from paying the entry tax. the supplies as various agreements have been worked out by traders with establishments like hotels on long terms basis in Goa. The state government, he said, has been collecting average Rs 500,000 as entry tax right from the day it was imposed on the state borders. Dhavalikar said the collection would have been Rs 10-15 lakh (Rs 1-1.5 million) daily if these neighbouring districts were not exempted from paying it. The state government will spend the money collected through this tax on the upkeep and upgradation of highways and district roads, he said. Goa expects to collect Rs 100 crore (Rs 1 billion) from this tax yearly. Earlier, protests against the tax were witnessed in parts of neighbouring Sindhudurg district in Maharashtra on April 15. Various trade bodies from Maharashtra and Karnataka had also met Goa Chief Minister Manohar Parrikar and decided not to agitate while giving eight days time to the government to work out a permanent solution. However, the traders later decided to go ahead with the indefinite strike.